I was very honored a few weeks ago when a representative of The National Committee for Employer Support of the Guard and Reserve stopped by to present me with their “patriotic employer” award. One of our automotive instructors, Sgt. Dave Sarna, had made the nomination for this award. Then I recalled how touching it was earlier in the summer when Sgt. Sarna delivered his orders to me indicating that he was being called up to serve his third tour of duty in the Middle East…this time leading a unit to clear roadside bombs in Afghanistan. I was being thanked for supporting an employee to serve in the military and all I could think about was the incredible sacrifice that Sgt. Sarna and all his comrades were making on our behalf. I was so pleased to see our Foundation create a new scholarship fund this year—the LZ Scholarship Fund. Since we have become the “landing zone” for many returning veterans, it’s quite fitting, and a way that we can provide additional support for our veteran students. At our Staff In-service last Friday, I had the pleasure of announcing this new fund. Here’s a brief video clip of Sgt. Sarna and one of our graduates, Specialist Yaeger, delivering a brief message to our faculty and staff from their training location. I certainly wish these brave men, and all with whom they serve, the very best in the months ahead. I had a chance to welcome all of our international students to the College late last week. What an amazing opportunity to see such a large group of talented, fearless, and eager young people from all over the world embrace their educational experience here at FVTC! These smiling faces were from Guatemala, Egypt, the Netherlands, France, Mexico, South Africa…every corner of the world…as introductions continued. And all, no matter where they were from, looking for a better life through education. How terrific that we’ve been given the opportunity to weave students from all over the world into the fabric of our organization! Then, there was something else quite magical that I happened to notice. It was the expressions on the faces of several of our English Language Learning (ELL) faculty in the room. As several second year students introduced themselves, where they were from and what they were here to study…they did so in English. You see, many of these students arrived here a year ago and spoke no English at all. It was our ELL faculty who helped them learn the English language (and very quickly). There was great pride in the faces of our faculty as no interpreter was needed for these introductions. Such a warm and joyful event, filled with pride in last year’s accomplishments and the anticipation of what the new academic year will bring! 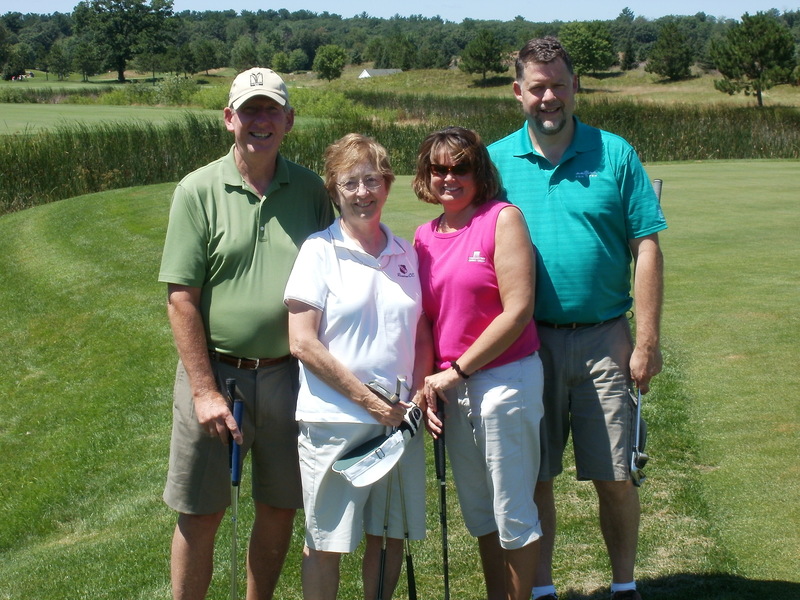 Representing Community First Credit Union at the Waupaca Golf Outing were Dennis and Mary Hultgren, Mary Sullivan, and Scott Sauer. Dennis is also a FVTC Foundation Board member. This is a very busy time of year for our FVTC Foundation in raising money to support student scholarships. We just concluded two very successful golf outings for this purpose—one was held in Waupaca and one in Wrightstown. Our Foundation staff and volunteers put tremendous energy into events such as these because they know that great results mean more scholarships for students. And, along the way, the golfers and supporters of these events were treated to a very enjoyable experience with good weather as an added bonus. Thanks to everyone who helped the Foundation raise more than $83,000 at this year’s outings to support scholarships for needy students. Despite some wet ground from all of the rain, the annual EAA AirVenture went on with thousands of aviation enthusiasts attending from around the world. We’re honored to participate in this event each year through our aviation-related programs—Aeronautics Pilot Training, Aircraft Electronics, and Airframe and Powerplant Mechanics. These exciting programs are operated out of our Spanbauer Center in Oshkosh. This year our two flight simulators got a big work out from nearly 100 aspiring female pilots in conjunction with EAA’s Women Soar organization! Our faculty and staff were delighted to host this organization over two days for an “off the ground” experience in our high-tech simulators.